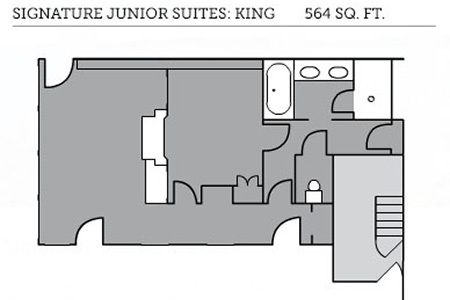 The Junior Suites are comprised of a bedroom with a king size bed and connecting parlor with a pullout sofa bed. The unique features of these spectacular waterfront accommodations include a dual gas fireplace, two flat screen televisions, exquisite paneling and millwork, elegant marble bathrooms and wireless remote controls. The Junior Suites are complemented by water view patios with private fire pits.